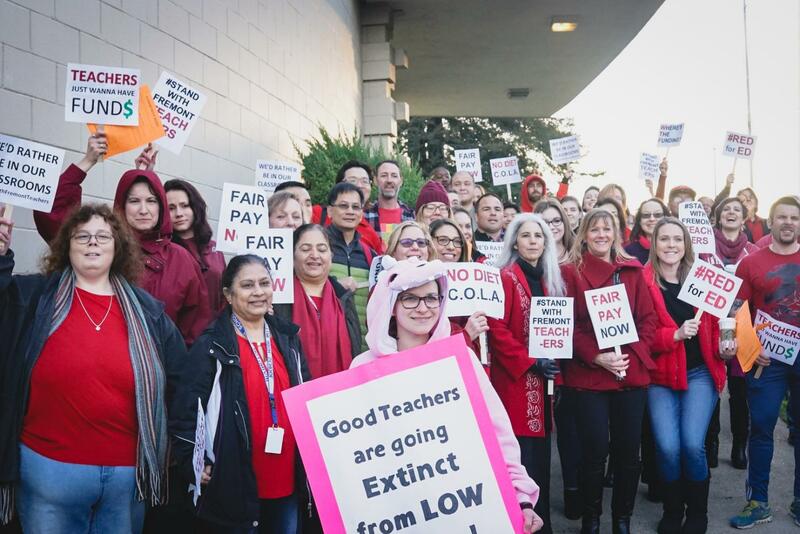 On December 12, 2018, FUDTA members collected outside of the school district building to speak out in favor of a salary increase in light of the recent COLA (cost of living adjustment) given to districts by the state government. Teachers protested outside the district building from the end of school until 6:30 in the evening when the official board meeting began. Bay Area news sources, [name the media companies], came to cover the event, providing light for the teachers still collected outside the parking lot after dark. Several of Irvington’s own teachers were present at the event, including Ms. McCauley who advocated for the often-dismissed work of school librarians along with Mrs. Stilwell, Mr. Stilwell, and their son holding a protest poster. Ryan Howard, English teacher at American High School and organizing chair of FUDTA, reported that over 800 teachers were expected to turn up to the meeting that night. Howard commented that one of the larger and longer going issues of board meetings was the lack of willingness of the school board to discuss negotiations. Because of the surplus of people at that meeting, many had to go into the other two conference rooms and view the meeting through the livestreams playing on the TVs in those room. However, that night, the typical livestream was down, so neither the teachers in the other two conference rooms, or the teachers who could not afford to stay any longer because of familial responsibilities or strenuously long commutes, could not stay updated through the night. Knowing they were being recorded, from the back of the room, teachers held protest signs backwards behind their heads to show on the livestream. Despite FUDTA informing the school board ahead of time of their collected arrival, salary negotiation was still not on the meeting agenda. Therefore, people did not get the chance to speak about the issue until “oral communication” began hours later. At every board meeting, oral communication is the section dedicated to hearing miscellaneous commentary from the public. Before the meeting began, there were between “five to six hundred people” who signed up to speak, according to Administrative Assistant Patty Sandoval. Eventually, instead of reading out every name card submitted, people began lining up to speak. Most high school teachers had left by then, and only few students remained as well. Due to the large amount of people signed up to speak that night, the board also agreed to restrict speaking time to one minute, compared to the usual three minutes. Susan Hawkins, a science teacher at Ardenwood Elementary. was just one of the many teachers who, even with both a masters degree and PhD, spoke about Fremont’s rapidly growing cost of living. “I commute 150 miles a day,” Hawkins explained as she hit the one minute mark. As she kept speaking against the timer going off, President Michelle Birke repeated, “Thank you very much,” proceeding with turning Hawkin’s microphone at the podium off, before deciding, “Alright I think we’re going to have to take a recess” and then standing and leaving her seat. Later that night, when other speakers went over their time, the board again threatened to go into a ten to twenty minute long recess. The entire meeting finally came to an end on Thursday, December 13 at 12:06 AM. On January 16, 2019 the FUSD board finally convened to discuss the current disputes over the Work to Rule teacher pay dispute. After several months of trying to reach a compromise over a 3.71% salary increase, the district has upheld a firm decision to stick to a 0.71% salary increase. Overall, despite hosting 2 board meetings regarding the issue, the district has not changed its position since the board meeting of June 2018 which provided teachers with a 1.33% salary increase. Due to the district’s unwillingness to compromise, several students at Irvington High School have attended board meetings in order to speak up against the issue and provide a voice for the students and teachers. In addition, student Sid Khabiya (12) mentioned his discontent with the outcome of the board meeting. As a member of the Irvington Robotics club, Khabiya and his team were disappointed when they found out that the district was unable to come to a consensus. With the resurface of work to rule, students have once again begun to band together to stand with the teachers, creating non-profit student- run activist groups. Such groups aim towards increasing awareness and the student voice regarding the issue. One organization in particular is the newly made group, “Students Rise”, On the other hand, some students are less accepting of work to rule, complaining of being used as “bargaining chips.” Other students remain sympathetic to FUDTA cause. Teachers following work to rule are actually just doing their exact job; they “aren’t paid to be your friend”, said past student board member Zuhair Imaduddin (12). Additionally, despite the rise of these new student organizations, fewer students came to speak at the January 16 board meeting than previous ones. Looking towards future board meetings, if a consensus is not reached, FUDTA is planning to strike to get the attention of the district. As seen in districts such as Los Angeles, districts have only come to negotiate when faced with the harsh reality that many of their schools were being shut down. However, it is most definitely a last resort for the teachers at Irvington.